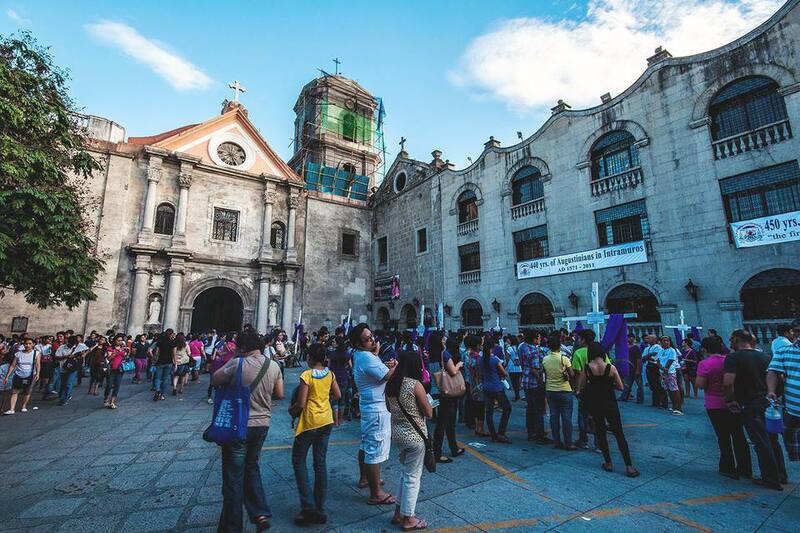 In the Philippines, the San Agustin Church in Intramuros, Manila is a survivor. The present church on the site is a large stone Baroque construction, completed in 1606 and still standing despite earthquakes, invasions, and typhoons. Not even World War II - which flattened the rest of Intramuros - could topple San Agustin. Visitors to the church today can appreciate what the war failed to eliminate: the High Renaissance façade, the trompe l'oeil ceilings, and the monastery - since turned into a museum for ecclesiastical relics and art. Walk the Walls: Read our walking tour of Intramuros. When the Augustinian order arrived in Intramuros, they were the first missionary order in the Philippines. These pioneers established themselves in Manila via a small church made of thatch and bamboo. This was christened the Church and Monastery of Saint Paul in 1571, but the building didn't last long - it went up in flames (along with much of the surrounding city) when the Chinese pirate Limahong attempted to conquer Manila in 1574. A second church - made of wood - suffered the same fate. On the third try, the Augustinians got lucky: the stone structure that they completed in 1606 survives to the present day. When the Spanish surrendered to the Americans in 1898, terms of surrender were negotiated by Spanish Governor General Fermin Jaudenes in San Agustin Church's vestry. As the Americans retook Manila from the Japanese in 1945, the retreating Imperial forces committed atrocities on this spot, massacring unarmed clerics and worshipers within San Agustin Church's crypt. The church's monastery did not survive World War II - it burned down, and was later reconstructed. In 1973, the monastery was renovated into a museum for religious relics, art and treasures. Heritage Hunt: Read about Southeast Asia's UNESCO World Heritage Sites. The churches built by the Augustinians in Mexico served as a model for the San Agustin Church in Manila, although adjustments had to be made for the local weather conditions and the quality of the building material quarried in the Philippines. The compromises led to a rather simple façade by the Baroque standards of the time, though the church is not entirely bereft of details: Chinese "fu" dogs stand in the courtyard, a nod to the Chinese cultural presence in the Philippines, and beyond them, an intricately-carved set of wooden doors. Within the church, the finely-detailed ceiling immediately catches the eye. The work of Italian decorative artisans Alberoni and Dibella, the trompe l'oeil ceilings bring the barren plaster to life: geometric designs and religious themes explode across the ceiling, creating a three-dimensional effect with paint and imagination alone. At the far end of the church, a gilded retablo (reredo) takes center stage. The pulpit is also gilded and decorated with pineapple and flowers, a true Baroque original. Pray Tell: Check out our list of the Philippines' top churches. The church's former monastery now houses the museum: a collection of religious artwork, relics and ecclesiastical props used throughout the church's history, the oldest pieces dating back to the founding of Intramuros itself. The only surviving piece from a bell tower damaged by an earthquake stands guard at the entrance: a 3-ton bell inscribed with the words, "the Most Sweet Name of Jesus". The receiving hall (Sala Recibidor) now houses ivory statues and jeweled church artifacts. As you visit the other halls in turn, you'll pass by oil paintings of Augustinian saints, as well as old carriages (carrozas) used for religious processions. Entering the old Vestry (Sala de la Capitulacion, named after the terms of surrender negotiated here in 1898) you'll find more church paraphernalia. The succeeding hall, the Sacristy, showcases more prosaic items - Chinese-made chest drawers, Aztec doors, and more religious art. Finally, you'll find the former refectory - a former dining hall that was later converted into a crypt. A memorial to the victims of the Japanese Imperial Army stands here, the site where over a hundred innocent souls were killed by retreating Japanese forces. Up the staircase, visitors can visit the monastery's old library, a porcelain room, and a vestments room, along with an access hall to the church's choir loft, which bears an ancient pipe organ. Visitors to the museum are charged P100 (about $2.50) entrance fee. The museum is open between 8am to 6pm, with a lunch break between 12 noon to 1pm. Sinulog Parade in Cebu Kicks Off in January - Ready to Party?